Suzanne Belperron was born Madeleine Suzanne Vuillerme on September 26, 1900 to Jules Alix Vuillerme and Marie Clarisse Baily-Maitre in Saint-Claude, France. Her mother encouraged her talents and enrolled her in the Municipal School of Music and Fine Arts quite a distance from the family home. In the 1917-18 competition at the school, she was awarded the first prize for her enameled pendant–watch. Befriending Germaine Boivin, daughter of René Boivin, while they were both students, she joined the Boivin firm as a modelist-designer. She was a great success at Maison René Boivin rising to the rank of co-director. In 1924 Suzanne married Jean Belperron, an engineer, and together they moved to the Montmartre area of Paris. Designers with the major jewelry houses traditionally remained anonymous, working behind the scenes to promote the house. 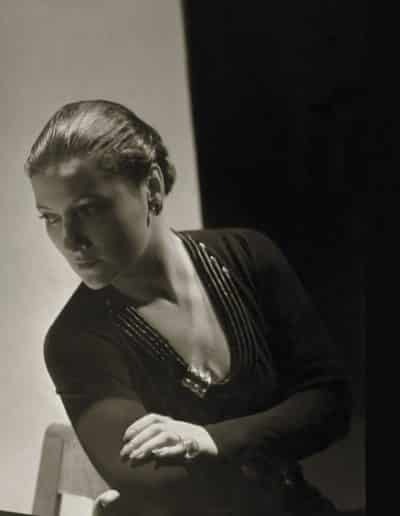 Seeking to make a name for herself and rebelling against this culture of anonymity, Suzanne resigned her position with Maison René Boivin in 1932 accepting a position working with pearl and gemstone merchant Bernard Herz as their exclusive, and more importantly, recognized designer. Herz had been a supplier to Maison René Boivin since 1912 and therefore they had known each other for quite a long time. She was given free reign at Maison Bernard Herz and it was here she gained acclaim in her own right, becoming a major figure in the jewelry world alongside such luminaries as Cartier, Boucheron and Van Cleef. Belperron created distinctive, unusual jewelry using large stones and undulating forms. She often collaborated with the client to achieve the exact right tone of the jewel. Her designs responded to the desires of a younger generation who wanted bolder, more distinctive designs. Combining large, sculptural, carved semi-precious stones with diamonds and other precious gems, she created a bold, dramatic effect. 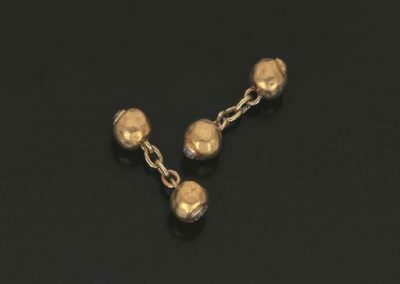 Belperron maintained her shop at 59 rue de Châteaudon where clients privately viewed her jewels by appointment. Her clients received the address discreetly, by word of mouth, and notables such as Elsa Schiaparelli, Fred Astaire and the Duchess of Windsor called on her personally to make their selections. Three Carved Gemstone Sculptural Rings with Pearls by Suzanne Belperron. In the style of a dressmaker, Belperron kept precise measurements of her client’s fingers, wrist, and neck. She often tailored an item to the individuals’ skin tone, facial structure or the shape of her hands. Taking into consideration the desires of the client, she worked with her measurements and other meticulous notes to ensure that each creation would suit the customer perfectly. This period of evolution in woman’s attire inspired a new aesthetic in jewelry as well. For the first time, jewelry design was considered integral to the clothing it was being worn with. Some couturiers, Coco Chanel and Elsa Schiaparelli, to name two, took this to the next step and created their own fashion jewelry-lines to compliment their clothing designs. Fashion photography played an integral role in solidifying the relationship between clothing and jewelry. The Nazi occupation of France during World War II saw her partner, Bernard Herz, interned and later murdered in a concentration camp. Belperron took over the company in 1942. This new firm traded under the name Suzanne Belperron SARL throughout the war years. After the war Belperron partnered with Herz’s son Jean and revived the name Herz-Belperron. This partnership remained in place until her retirement in 1974. The Herz-Belperron company was dissolved in December of 1975. 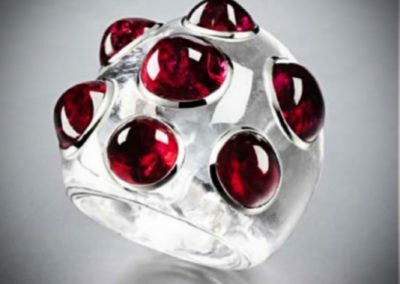 The rights to Herz-Belperron designs were sold in 1998 to Ward Landrigan of Verdura where they still craft and sell the designs under the name Belperron. 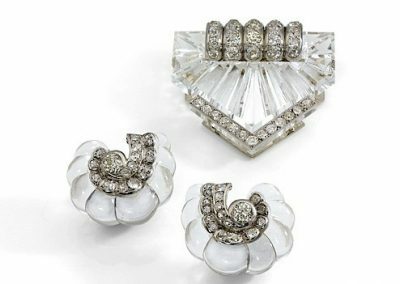 Carved Rock Crystal Brooch and Earrings, c.1935 Suzanne Belperron. Believing that her work needed no identification, she never signed a piece. 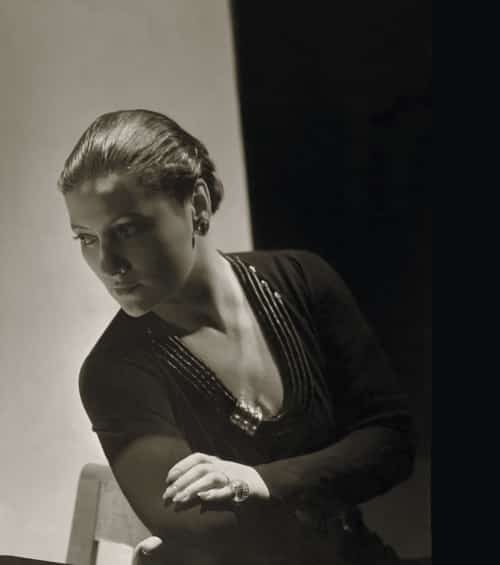 She was known to say ‘My style is my signature.’ Groëné et Darde produced her designs and marked them with their maker’s mark, which can be used to help identify Belperron designs. 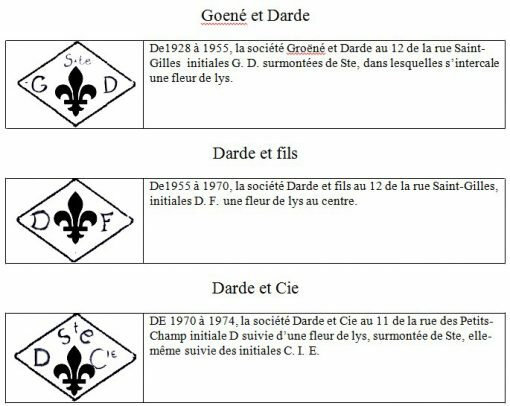 From 1928 to 1955 they used the initials ‘G.D.’ with an ‘Sté’ surmount and fleur-de-lys, from 1955-1970 they used the initials D.F. with a fleur-de-lys and from 1970-1974 they used a D with a fleur-de-lys and Sté surmount followed by ‘Cie’. After her deat, a new Herz-Belperron company was founded. An American firm, using the drawings they had acquired, went on to produce replicas of her jewels, signing them ‘Herz Belperron France’. These can be distinguished from the jewelry made during her lifetime, under her supervision, by that signature. Adrien Louart was responsible for the lapidary work that was required in many of her designs. 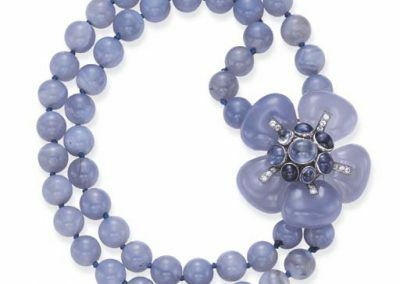 Carved chalcedony, quartz, and other gem materials form an integral part of the pieces in the Belperron portfolio. Often the technology involved in putting together Belperron’s designs did not exist and Louart had to invent the technique or tool to accomplish the desired result. Archives of Belperron’s work rediscovered in 2007 by Olivier Baroin, allow authentication of her work by comparison to the meticulous records, models, and drawings contained within. Suzanne liked to create large double clips that could be adapted to be worn together, separately or even on a bracelet. She set herself apart by using carved rock crystal and accented it with diamonds. While other jewelry houses were struggling with techniques to make metal and gemstones flow like ribbon, lace, and fabric, Belperron ignored the trend altogether and had her more rigid jewels carved from solid stone. Large floral motifs composed of individual gemstones arranged to depict the flower used variations in color to bring life to the creation. Flower heads and leaves carved from chalcedony and other gem material were a recurrent theme. Leaves often “dripped” clusters of pearls or other gemstones. Rounded mound-shaped and geometric designed brooches of carved chalcedony and quartz were studded with gemstones or pearls. 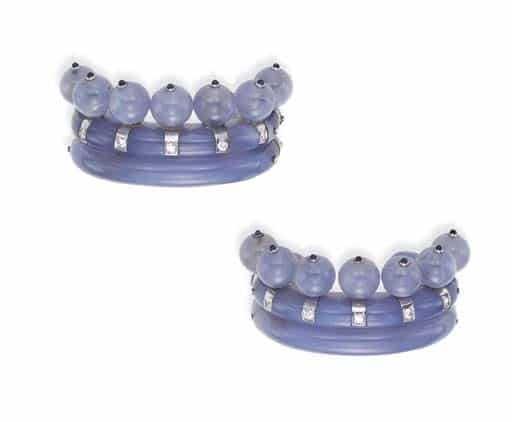 Pair of Chalcedony and Sapphire Bracelets by Suzanne Belperron. Photo Courtesy of Christie’s. Belperron’s so-called “double ring” bracelets were extremely popular. Designed with two bands across the top and joined in the back by a bar spanning the gap between the bands, these bracelets could be adapted to feature many different decorative motifs. Carved gems could also span the gap between the bands and plaques and geometric gem-set motifs perched atop the bands and gemstones could be bezel-set within the bands. Many of her clips did double duty as centerpieces on flat or ‘ludo‘ style bracelets. Her signature mosaic-like use of multi-colored and multi-shaped gemstones can be seen in wide strap bracelets clustered with bezel-set gems. Carved gemstone bangles, with or without gemstone inserts, were another example of her “signature” style. 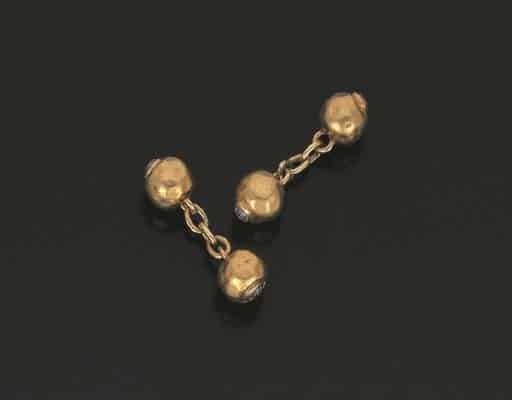 Gemstone beads strung in a row or in several rows with a large gem-set clasp/focal were another favorite. Gem-encrusted wide bangle bracelets were yet another of her “pet” styles. 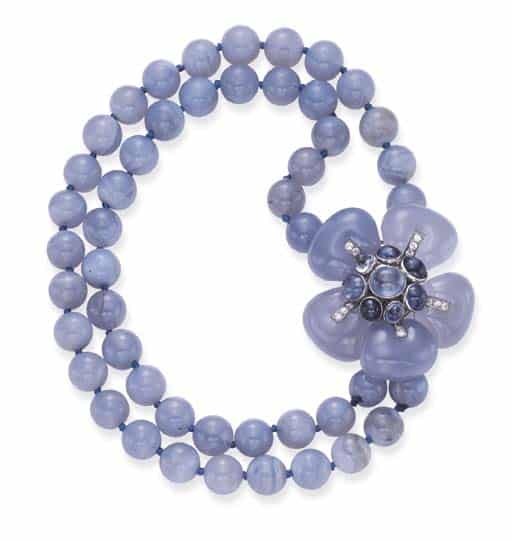 Chalcedony Bead and Sapphire Necklace by Suzanne Belperron. Photo Courtesy of Christie’s. Gemstone carving featured prominently here as well. Rings carved from chalcedony, rock crystal, wood and other materials featured gemstones or pearls nestled into the top of these voluptuous carvings. Large rings with mosaic clusters of vari-colored gemstones or rows of diamonds in geometric shapes were a recurrent theme. 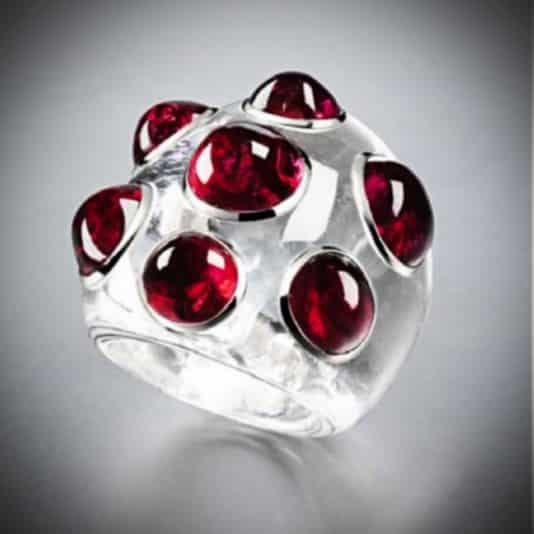 White Sapphire and Red Spinel Ring by Suzanne Belperron. 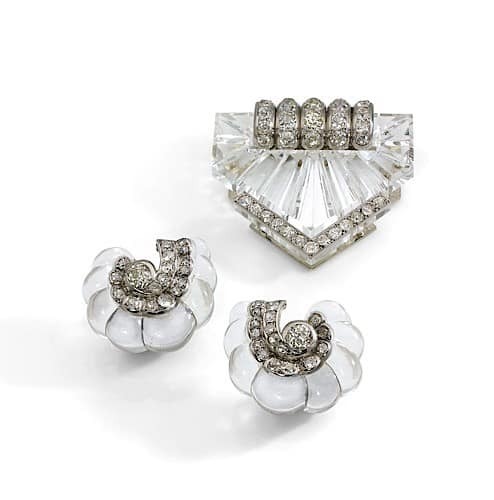 Hairstyles swept away from the ears set the stage for an era of fabulous earrings. 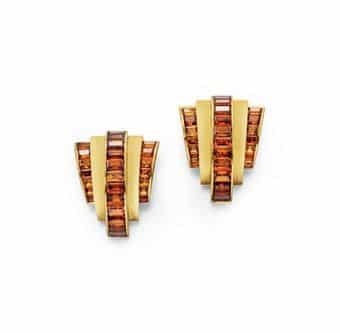 Large clip-on earrings were the style of the day and Belperron was equal to the task of creating interesting shapes and designs set with her signature carved gems. Spiral shells, leaves, fans and other textural shapes were her favorites. These large, gem-laden ear clips could be heavy and uncomfortable for the wearer. In order to counteract this problem, Belperron invented a system that clipped the earring to the lobe while a second clip circled behind the ear taking some of the weight off the lobe. 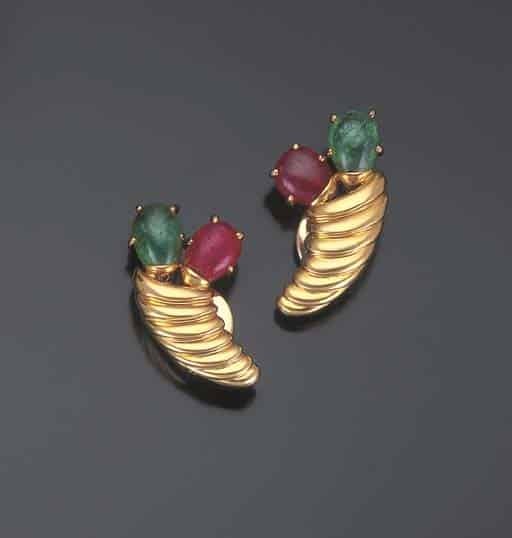 Pair of Ruby and Emerald Gold Earrings by Suzanne Belperron. Photo Courtesy of Christie’s. One of the few jewelry items remaining for a well-dressed man. 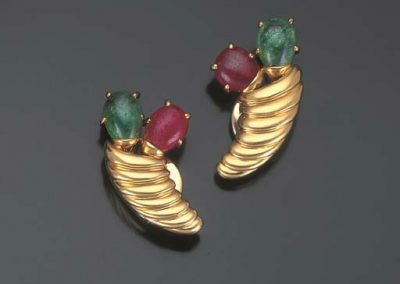 Belperron’s use of carved and cabochon gems suited cufflinks quite well. Sometimes a simple bezel around an interesting cabochon was the style while other examples featured a carved gem topped by a smaller bezel-set gem. Jewelry Typically not Signed. 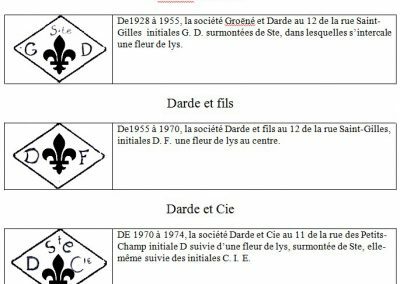 Sometimes with Manufacturer’s Mark for Groà«né et Darde. Archives and Designs purchased by Ward Landrigan. Archives of Belperron’s work, rediscovered in 2007 by Olivier Baroin, allow authentication of her work by comparison to the meticulous records, models and drawings contained within. Raulet, Sylvie and Baroin, Olivier. Suzanne Belperron, Woodbridge, Suffolk, UK: Antique Collectors’ Club Ltd., 2011.